Frequencies getting flabby? Sound-design getting weak? Can't stand your stereo image? With the new year, it's time to strengthen your resolve and get better in the studio once and for all. Get inspired now, revolutionise your workflow, and give your tracks the heft they deserve with our transformative guide. Grab this whole course as part of CM253, along with tutorial files and videos to get you started, and make this the year you make things happen! Harness powerful dynamics, EQ and distortion with this amazing free LVC-Audio plugin. T-Chain CM is seven plugins in one, allowing you to choose between processors for the sound you need. Readers of CM254 get it for free. Find out more about T-Chain CM in the video below, or read the full spec on our dedicated T-Chain CM page. With millions of YouTube views and some imrpessive remix credits including Ed Sheeran, AlunaGeorge and Earth, Wind & Fire, Spinnin' Records signee Throttle (aka Robbie Bergin) has already had an incredible career since his first release in 2012. We met up with Robbie at Red Bull Studios in Amsterdam during ADE 2017 to get the lowdown on how he makes his tracks, and we got the whole thing on video! See Throttle break down his Niko The Kid collab Pinata in Ableton Live – get the first half of the in-studio video session below, and get the full thing only with Computer Music issue 253! Get on down to the Cassette Club with the first of this month's sample packs. With over 500 tape-saturated loops, hits and hiss samples in this exclusive pack, you'll wonder how you can fit it all in your pocket! 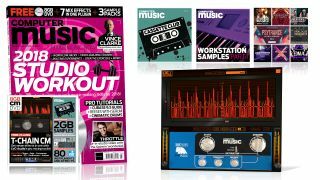 As a bonus, you also get 1028 Workstation Samples with this issue of CM, and there's a healthy crop of Loopmasters material, taken from the sample giants' hottest new releases. Cook up tearing basses, woofer-shaking subs and midrange nastiness with Xfer's uber-synth, as we take you through a cookbook of modern and classic Reese bassline patch-making skills. Across nine tutorials, we'll show you how to make those grungy, snaking lines for every occasion! Check out the video below for a taste, and get the rest only in CM253! Steinberg recently dropped the traditional point-update to their flagship DAW, and we've got you covered with this guide to Cubase 9.5's latest and greatest features! From workflow tweaks such as the media browser, through the new wavetable supersynth Flux, and taking in production staples like Cubase's new automation curves, we'll show you have to use version 9.5 to its fullest. In the video below, you can get a preview of the action, and you can get the rest with your print or digitl copy of issue 253. Get our opinions on today's best new music software as we review Dmitry Sches Thorn, NewFangled Audio SpecOps, and the UAD-2 Empirical Labs Distressor clone.